There was a time in my life when I tried extreme couponing. All the super organized ladies on the news made it seem like a really great gig. But here’s the catch: I am terrible at it. I don’t like clipping coupons, I don’t like spending an entire day flipping through newspapers and browsing online to learn which stores allow double coupons and on what days. Not to mention the fact that I usually forget my bundle of coupons at home anyway. What I much prefer is being able to get savings with a touch of my finger or better yet, without having to do anything at all! If you are like the rest of the world and have your smart phone with you on hand at all times, then I have got the 10 best rebate apps for you. Keep reading to check out how they all work, how they benefit you and how simple it is to get money back without having to clip a single coupon. It’s simple to say that rebate apps are like the coupons of the future. You get all the deals without having to do as much work. Better and faster, that’s what smart phones are all about after all! Let’s chat a bit about how they vary from coupons and how you can often benefit more from rebate apps than you can from coupons. In reality, they are doing so much more for the consumer as well as for big brands. Big brands are able to reach a wider range of potential buyers and in some cases get additional marketing through the app. By helping stores and brands sell more, the rebate app guys earn a commission off anything purchased. You can still use coupons! If you still love your coupons, good news! Most rebate apps can be stacked with manufacturer coupons to help save you even more! Perhaps my favorite thing about using rebate apps is that they don’t only work at major chain stores or in the grocery store isles! You can use some of these apps to save online, with flights, hotels and even on Groupon purchases. 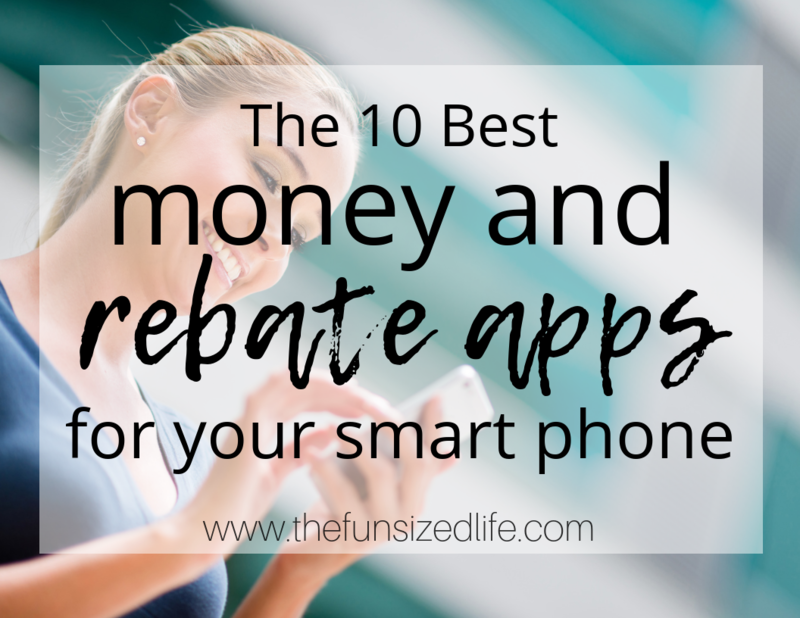 Not all of these awesome money apps qualify as “rebate” apps, but you’ll see just how beneficial they can be at getting you more money with very little effort. Let’s dive in to the top 10 money apps for your smart phone so you can learn just how they benefit you and what you need to do to take full advantage of their perks! Ibotta is my personal favorite way to make money on my grocery purchases. Beyond that, I have also used it to make money at Joanne Fabric, Amazon, and Groupon. Use this link to get $10 just for signing up. To get started, just download the app, choose a store you want to shop at and select any rebates that you want to take advantage of. Once you have made your purchases, snap a photo of your receipt and almost instantly Ibotta will give you your rebate! As soon as you have saved up $20, (it only took me one trip,) you can start cashing out. Ibotta gives you the option for gift cards or a PayPal deposit. Save even more! Make an extra $5 with Ibotta when you recommend it to friends! My favorite way to save! I love using Ibotta alongside my Target Debit Card, Target Carthweel, and any additional coupons I might have. If you are a big double discount kinda person, you will love the discount tracker in my Fun Sized Budget Bundle! Dosh is an app similar to Ibotta in the sense that you get rebates on purchases you make and you’ll receive a $5 sign on bonus plus additional credits for each card you link. Click here to get your $5 sign on bonus. When I first signed up, I was a little weary of Dosh because the way it works is by linking up with your credit or debit cards and then automatically giving you rebates on your purchase. The idea of getting automatically paid on purchase I make sounded super exciting, but it made me nervous linking my cards. I linked my cards and my husbands and Dosh credited us for each card we added which was exciting enough to calm my nerves a little. If linking certain cards make you nervous, I recommend starting small. Maybe just linking credit cards instead of debit cards that link directly to all of your cash accounts. One super exciting feature I liked about Dosh is that it doesn’t just work with major stores or restaurant chains, but also partners with local businesses so you get a huge variety of places to choose from and you don’t feel obligated to stick to the same old chain restaurants. Dosh also works with a wide variety of online shopping so if you tend to purchase more online, Dosh has totally got you covered. Ebates has been around for a long time, and still some people have no idea how many perks it offers! Click here to earn a $10 welcome bonus. Personally, I prefer to use Ebates from my computer. With their website I can see everything in one glance. I like being able to see all the deals right away so I can pick and choose which ones I want to take advantage of. Some days a store will be running a 50% off sale and Ebates will give you an additional 10% back on top of that! Not only do they tell you about their deals, they also help you find the best discounts in all of your favorite stores, restaurants and hotels! BeFrugal is your ultimate site when it comes to finding every coupon and discount available to you! It’s so simple to scan and browse all the latest details. When preparing to go grocery shopping, I will scan all the latest grocery coupons. All you have to do is click on an offer that you want to take advantage of and BeFrugal will save it for you. When you have finished “clipping coupons” there will be a big, red button that says “Print Coupons.” It’s literally that easy! BeFrugal also has a $10 bonus when you first get started and usually has $300 worth of savings waiting for you! It’s really a win-win. Click here to get your $10 sign on bonus! You can also save money on restaurants, and stores. Since I am a big Target shopper, I love taking advantage of BeFrugal’s coupons when shopping there. I can often find coupons from BeFrugal that match up with Target’s Cartwheel discounts. By pairing them up, I’m making sure I save the absolute most amount of money. Then I take advantage of my Target debit card to get an extra 5% off my total purchase! Checkout 51 is like a mix of Ibotta and BeFrugal. Once you open the app, you can just start browsing all of the current rebates that are offered. By clicking on them they are automatically saved. Be careful when browsing, because sometimes certain rebates are offered at certain stores. You will be able to tell by the store’s symbol in the bottom right corner. For the most part, all the different rebate offers work with any purchase at any store! After you have made your purchase, all you have to do is select the offers you took advantage of, snap a picture of your receipt and you will get credit for your rebates! It’s as easy as that! Like BeFrugal, I love that Checkout 51 often has deals that over-laps with Target’s Cartwheel, or BeFrugal’s coupons. Drop is the most recent app to make my list and it works a little differently than the rest. When you first get started with Drop, you will be prompted to choose from 5 stores or restaurants that you want to be linked up with. Choose these wisely because you won’t get to change them! I chose Whole Foods, Trader Joes, Target, Chipotle and Starbucks. Don’t worry, you’re not limited to these 5 places. Every time you log in Drop will show you some of the latest offers and points you can earn! My absolute favorite thing about Drop is that I have to redeem for gift cards! A lot of times when I get money back, it goes toward bills or future grocery budgeting. When I have the option of getting a gift card, it’s a little more exciting. Like I’m forced to treat myself! Acorns is an easy to add app that starts investing your money for you! This is the perfect app for first time investors who are hoping to dip their toes into the world of investment without diving in right away. Acorns syncs up with your bank account and will round up the purchases you make and invest your spare change for you. So if you spend $4.75 on a cup of coffee, Acorns will round up that extra .25 cents and invest it for you! It might not sound like a lot, but every little bit counts! You also have the chance to make one time or recurring investments. So on top of your spare change you could easily start a recurring investment of $50 per month. While I started Acorns more aggressively, I wound up withdrawing around $200. Since then I have been just doing round up investments and in the last 2 months I have $77 in my account. That may not sound like much, but like I said, every little bit adds up. Get started now. My favorite way to invest! I love taking advantage of Acorns one time investment option. Whenever I have a few extra bucks, it’s always helps to be able to put it toward my Acorns investments. I like doing this and seeing the difference it makes in my projected growth. Honey is the latest money saving app I have started using. When I lost my coupon while shopping at American Eagle, I ditched my purchase, came home and tried shopping online. Lucky me, there were major discounts at the store and when I installed Honey, it found even more discounts for me! You can see the screen shot below, I have added Honey to my Chrome internet browser. See the little 3 by the “h” symbol? That means Honey found 3 possible discounts to use on American Eagle! What I love the most about Honey is that I don’t have to strategize or plan ahead at all. The little warning popping up in my browser letting me know that I have potential savings waiting is absolutely awesome. It’s very hands off which is my kind of savings! Similar to Honey in its simplicity is National Consumer Panel. With this app, you go on with your shopping as normal and then scan your barcodes when you get home. You do have to apply to become a part of the National Consumer Panel shopping panel. But once in, it’s very easy to earn rewards through shopping and surveys! Trim is a great app that will sync up with your bank accounts to monitor your spending habits. Once it has analyzed your spending, Trim will find different areas where you could be saving more money! They will even negotiate with your billing companies for you! You can also get daily updates on your accounts. Trim will notify you of new transactions and purchases, which can be great to ensure you don’t have your identity stolen. Also to help ensure your safety, Trim will notify you of low balances in your accounts! Make money just by signing up! Whether you think you’ll benefit from these apps or not, give them a try. The majority of them give you instant cash back or rebates just for signing up or linking your cards! You will lose nothing and are guaranteed to make some money just by signing up. Some things are too good to be true and some are just too good to pass up. Everyone is always talking about eBates and other rebate apps, but I’ll be honest I’ve always been too lazy to bother. Is it truly worth it? I’m more about the credit cards that give you points for travel and so one, but I do suppose I could double up those rewards. I’ll check some of these out tho. Exactly. I’m all about doubling up as much as you can! In fact you can often get money back from both of these on the same purchases! Which I should probably mention! This is a really great list! I use and enjoy Ibotta so I’ll have to try out these others. Great list! I haven’t heard of Dosh, so I’m going to give that a try! Thanks! I believe it’s “newer” but it is totally amazing. This is great I will have a look into these ? They are little life savers! This post is so useful, I definitely have to check these out. This is a good list. I already use Ibotta. I’ll check out some of the other apps, too. Thanks.